Games and play behavior have long been established as a distinct and ancient component of the human experience. From the ancient Egyptian game of Senet to the digital doll-house world of The Sims, games have held at various times and in various cultures a host of meanings, purposes, and roles. Typically though, at least in the mass culture of 21st century America, the word “game” is often synonymous with entertainment. While there has been an increasing movement in the past decade to consider video-games as a form of art, the still widely popular notion of games as relatively harmless distraction, for artist and game designer Mary Flanagan, is undeniably problematic. Given the rising global popularity of mass produced digital computer games, Flanagan argues in her book Critical Play that it is imperative for us to approach games critically–to be conscious of the messages we send and the ideologies we reproduce in creating and playing games. As cultural texts that are inseparable from the historical and cultural moment in which they are created, as well as the ideologies and worldviews of their creators, commercially produced games bring with them the potential to reproduce (either consciously or unconsciously) and render innocuous ideologies like racism and colonialism under the guise of “innocent fun.” As Ike notes in his blog post on games like Scramble for Africa and Sid Meier’s Civilization IV: Colonization, the reproduction of harmful ideologies in popular games is hardly a practice confined to the nineteenth century. 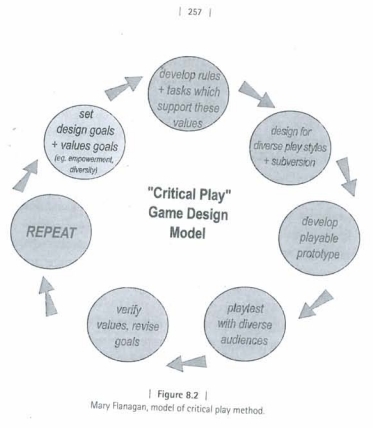 In order to recognize and prevent the continued incorporation of these elements into games, and to place activism at the forefront of game design, Flanagan proposes a concept that can be applied in the creation and consumption of games by artists, activists, players, and designers: critical play. What is critical play and why are you piling all of those Dungeons and Dragons books on my desk? In essence Flanagan defines critical play as the creation or occupation of “play environments and activities that represent one or more questions about aspects of human life.” It is “characterized by a careful examination of social, cultural, political, or even personal themes that function as alternates to popular play spaces.” Specific examples of critical play strategies include but are by no means limited to: attempting to cheat a system that feels unfair, asking for a qualification of explicit rules, revising or rewriting systems of play to make a statement or explore an alternative space, and outright rejecting or “unplaying” the goals/objectives/rules set before you by the game you are playing and using your own. Despite the negative or antisocial behaviors implied by terms like unplaying and cheating, critical play is at its core a creative rather than a destructive act. The goal is to question, propose, and implement an alternative vision rather than outright destroy. As a design methodology, critical play asks game designers to tear down the current boundaries of the games industry by inviting more diverse voices and nontraditional (read non-white men) gamers into the field, both as designers and as players. Flanagan’s Critical Play Game Design methodology. Please forgive me for the crooked image, I can’t afford Photoshop. Now, for those of you who have known me for more than a week, I’ll ask you to forgive me, because I’m about to get back on my soapbox about Tabletop Roleplaying Games again. In the hopes of convincing you to read this I’ll just lay down my thinking right here: tabletop games are a fantastic example of Flanagan’s concept of critical play in practice. This is not to say that tabletop RPGs as a form are quantifiably more critical and socially conscious than video-games or board games, but that, for a number of reasons, they lend themselves far better to putting those ideas into practice. 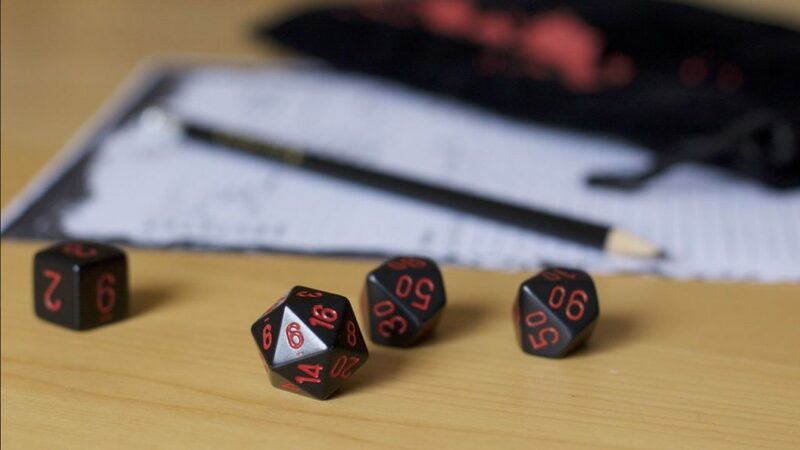 The subversive notions of revision, reskinning, unplaying, are baked into these games, sometimes implicitly, but often explicitly, as in the case of Dungeons and Dragons. In the latter, players are encouraged to adapt and revise rules and systems to the specific visions of their tables (not that developer encouragement or censure has ever stopped players from doing this). TTRPGs both by their nature as highly social narrative games, and by the sort of “homebrew” culture which has developed around them, allow a degree of player freedom to subvert and engage in critical play that is unparalleled. If you don’t like a rule or subsystem, you can change it. Neither Wizards of the Coast nor that guy with the anime avatar online can do a thing about it. Unlike digital games which in many cases require a significant degree of expertise to subvert (creating your own mods often requires in-depth knowledge of skills that range from programming to 3-D modelling), TTRPGs require nothing more than your imagination, a space to write, and assuming you don’t wish to write your own system from the ground up, a source-rule book to build off of (many of which can be found for free). In a cultural environment where the simple inclusion of non-binary options in a digital game’s character creator has been met with a sadly unsurprising degree of vitriol, TTRPGs, even those which do not explicitly include such options, present a system of play that allows marginalized communities to engage in critical play on their own terms, to tell their own stories. This is not to say that TTRPGs, nor the communities surrounding them are perfect. The simple truth is they are not. There are still practices and concepts even within mainstream systems like Dungeons and Dragon’s that warrant conversation and critique. The oft-used racial trait/racial alignment system being one particular example of a subsystem that players are increasingly questioning and moving away from. The presence of non-binary and transgender options at character creation in systems like D&D5E or Zweihander is a step forward, but it does not mean that every player at your local game shop is suddenly going to be supportive of non-binary players and player characters. Likewise the fact that such systems don’t force heterosexual traits onto player characters doesn’t rid the culture of homophobia. You don’t have to dig deeply into the internet to find that. In addition, much of the freedom offered by TTRPGs relies upon the assumption that players are able to find or create groups in which they can feel safe enough to engage in the sort of critical play described by Flanagan. And while self-publishing TTRPG materials online through sites like DriveThruRPG is in some ways less technically intensive than producing say an indie video game, it is by no means an easy or even profitable task. Game design is a difficult and time-consuming task, and despite growing popularity TTRPGs are far more niche than video-games. Think of the last 3 (or any number really I’m just being arbitrary at this point) games you’ve played. As Flanagan has shown, games can take any number of forms and don’t necessarily have to be video-games. Have you felt that there were content/systems within that warrant conversation or critique? Can you think of any ways you have “played critically” in the past? A game that I would have loved to see Flanagan play, or watch someone play, is the third-person shooter game Spec Ops: The Line. The game is an adaptation of Heart of Darkness that critiques shooter games and the idea of heroic violence, but it gameplay is all standard third-person shooter combat. I wonder how Flanagan would react to a game that gives the player no other options for playing except the one it condemns – is it a “you always lose” game or is it a flawed delivery of a critique? Spec Ops: The Line is a good one to bring up! I’ve not played it but I’ve seen so much discussion about it over the years that I feel fairly familiar with it. You bring up an interesting point about the tension between player agency and designer/artist vision. Is player agency requisite for critical play, or is it acceptable for a developer’s own artistic vision to be the driving force behind the experience? While I can’t really speak for what Flanagan would say about the specific critique or its delivery in Spec Ops: The Line, my impression is that she would likely place it in a similar category to the September 12th game she brings up in her chapter on Critical Computer Games. That game was also basically an instance of the only way to really “win” is to not play. Both are more interested in presenting a social critique rather than subscribing to traditional notions of success-failure or competition in games, though they undeniably possess gameplay characteristics.